I've noticed this bug in the past 1.8 snapshots. When I enter a village, sometimes I notice strange behaviors. 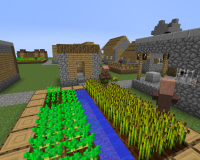 The first happens all the time: In the small farm houses, where the farmers should be, are usually other random villagers. 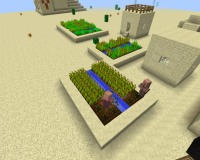 Some of these villagers will begin to harvest crops, just like farmers. 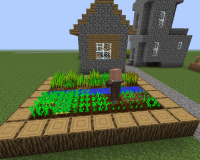 In fact, I've seen villagers that spawned in libraries or churches, and act the same, suggesting they don't need to spawn in a farmhouse to do it. I have pictures of blacksmiths and a butcher in this behavior, but have seen every type doing it. I found another example on this desert superflat seed (has to be the superflat "desert" present): -6503170732033053842, coordinates X-1415, Z1660, where a priest and blacksmith were farming. NOTE: This bug can be uncommon at times, and cannot be seen while the villager is spawned with a spawn egg. It can be seen upon new village generation only. It seems the seed DOES in fact matter. NOTE 2: It appears that it does not matter which world type, nor biome it spawns in. I chose superflat so as to find one easier. 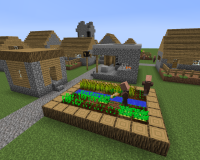 Also, villager spawning DOES matter depending on the specific buildings, in all past versions, including 1.7.4, farmer villagers all spawned in the small houses near the farms. MC-105243 Villagers of the wrong profession are farming, even if there is a farmer in the village. MC-118149 All Villagers spawned with /summon command act like brown robed.